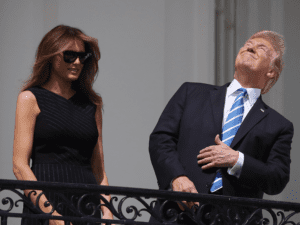 If you, like our nation’s president, looked directly into Monday’s eclipse, you might wonder: Did I just damage my eyes? Did you mostly take all the precautions but you think maybe you looked for just a second or two, by accident? Maybe you aren’t sure? And you think maybe this headache behind your eyes means you are going blind? Did you ignore the bazillion warnings and stare right at the partial eclipse for a good long while more than ten seconds, maybe even 20? Because … the rules apply to everyone BUT you? Or maybe you just couldn’t get eclipse glasses and weren’t going to miss it because of a bunch of worry warts who don’t know how to live? Or – do you think the glasses you picked up might have been bogus? No matter the cause, now – the next day or longer – your vision is blurry and there are spots where there should be words on the page? Then yes, go see an ophthalmologist. Or, since they are probably pretty booked right now, an optometrist. An eye doctor can look at your retinas and see if there is damage. Unfortunately, there is no way to determine this from an at-home test.